LAS VEGAS -- Five months after the announcement that Las Vegas would be getting an NHL franchise in 2017, the long awaited announcement of just what the team will be called arrived this afternoon at T-Mobile Arena on the Las Vegas Strip. 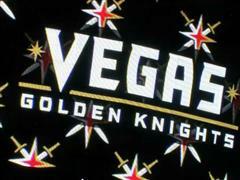 The Las Vegas professional hockey team will be known as the Golden Knights. Bill Foley, majority owner of the team wanted "Knight" to be a part of the name as he is a graduate of West Point where the athletic teams are known as the "Black Knights." Foley was joined by NHL Commissioner Gary Bettman and Golden Knights GM, George McPhee for the unveiling. Las Vegas Golden Knights owner Bill Foley unveils the team logo on the T-Moble Arena big-screen.